I’ve gotten a lot of spinning and plying done the first two days of Spinzilla. Here’s the condensed version. 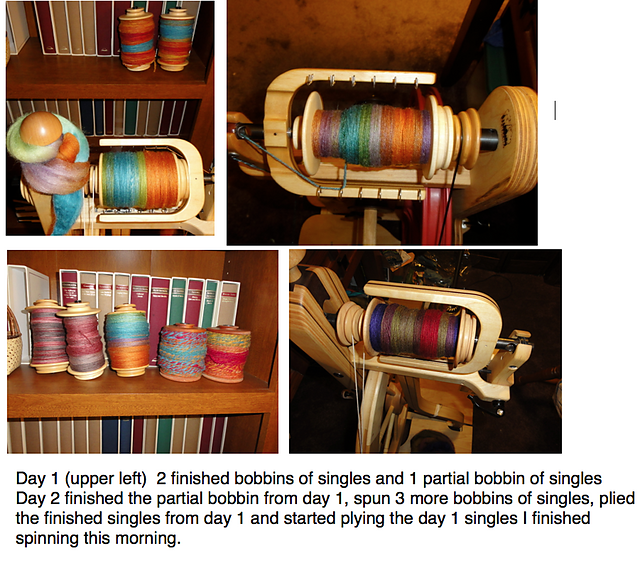 This entry was posted in Spinning and tagged Spinzilla 2015. Bookmark the permalink. Wow, good job! Spinning looks like so much fun. Thanks. Spinning is loads of fun. I have been interested in it for a very long time, but I was hesitant to even try it because I was afraid I would become obsessed, and I was already obsessed with knitting. But I finally gave it a try in 2012 when I bought some fiber and a drop spindle, and now I can’t help but wonder what took me so long. I might be overdoing it a little, but so far, no pain aside from the usual. I checked out your blog and, WOW! Your fluff turned into gorgeous singles and then a beautiful skein of 2-ply. Squee! Thanks, Laura. I wish I had even a fraction of the photography skills you have, but my little point-and-shoot Sony at least allows me to capture the pretty in my yarn even if the photo composition leaves something to be desired. And for once, the colors are spot on. Now that I am taking indoor photos of yarn, I find it is very hard! Getting the colors right is a big challenge. Especially red. It’s so difficult to photograph red.